A little confusion at the park enterance sent us to the incorrect loop, discovered shortly after we were in place. But camp host made a few calls and as it worked out we were able to remain in location. The helpfulness of each person along the way made this an excellent spot. We used this as a base to explore south central New Mexico. Great Views, affordable, but beware the showers. 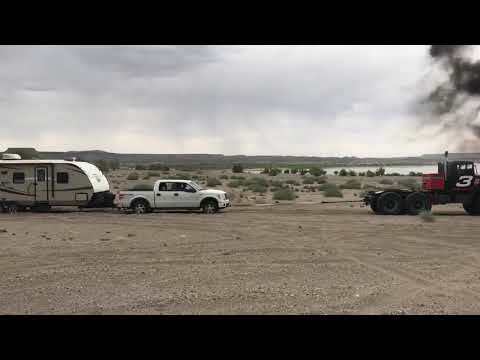 We camped in Loop B, which is supposed to have the best view of Elephant Butte Lake. It totally does, the views are excellent. Very affordable RV camping at under $20 a night, which is a steal with both water and electric hookups. But, the bathrooms - they are not great. The one closest to our site was closed (maybe temporarily, but nobody could give us an answer on that), and it's a 15 minute walk to the next one. The showers are the push button type where you only get 60 seconds of water at a time, which is ok, but the facilities are very run down and clearly not cleaned too often. Overall, great location and views, but bring a shower bag. We like to come here during the week when is not as crowded. Try coming on a holiday weekend and is no fun, way too many people. Be careful driving down to the shore to camp is very sandy and you can easily get stuck. Nice area, and probably one of the best areas in central New Mexico. I however prefer the areas more to the north of the state. This campground is clean, cheap and right on the lake. The amount of people varies. Good place to chill or swim. There is a place to launch boats as well, but the lake itself isn't all that big. I've seen people dish there before, but never seen anyone catch anything. Isn't too much to do around the area, and basically would just make a nice weekend trip if you were in that area.